Hello! 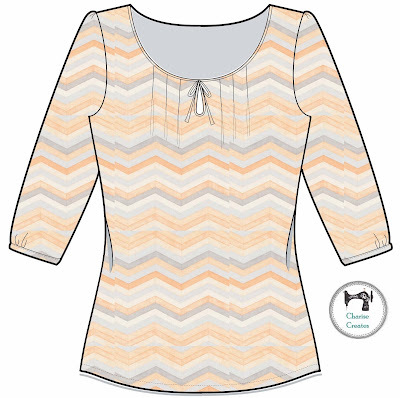 I am so excited to be a part of the Sew Mama Sew Palos Verdes Blouse Challenge! 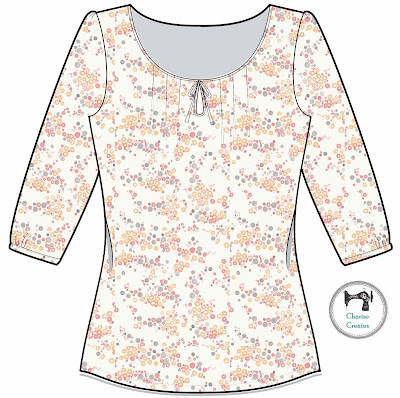 Each sewist was asked to make a blouse with Cloud 9's new fabric line - Palos Verdes. 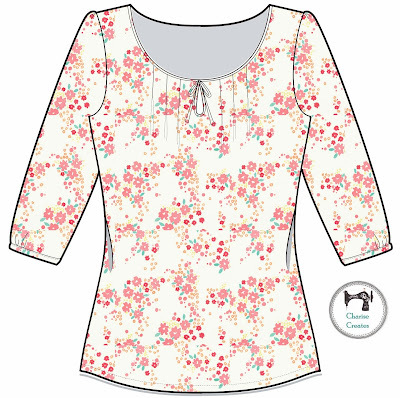 The fabric is a beautiful light weight cotton lawn. It is a dream to sew! For the challenge, we could use a commercial pattern or design our own. I decided to create my own design. 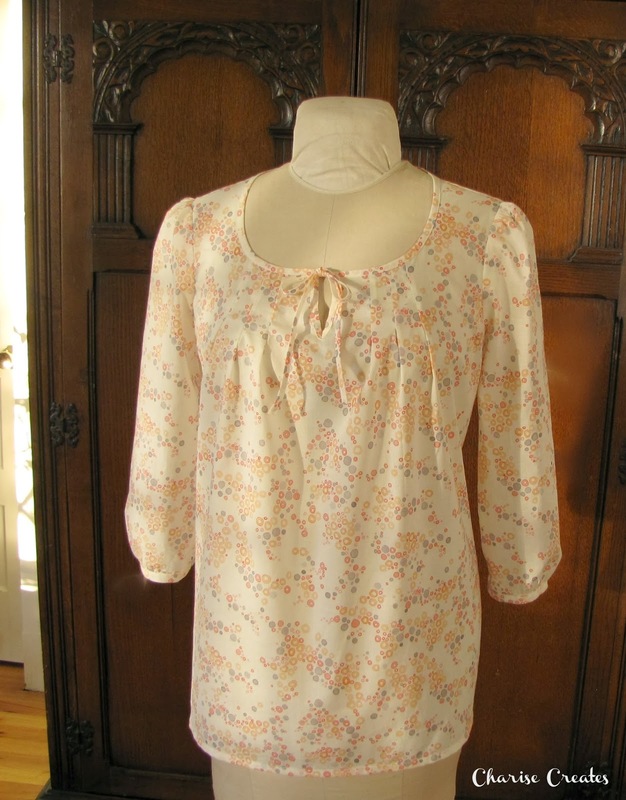 I'm calling it the "The Anna Blouse". 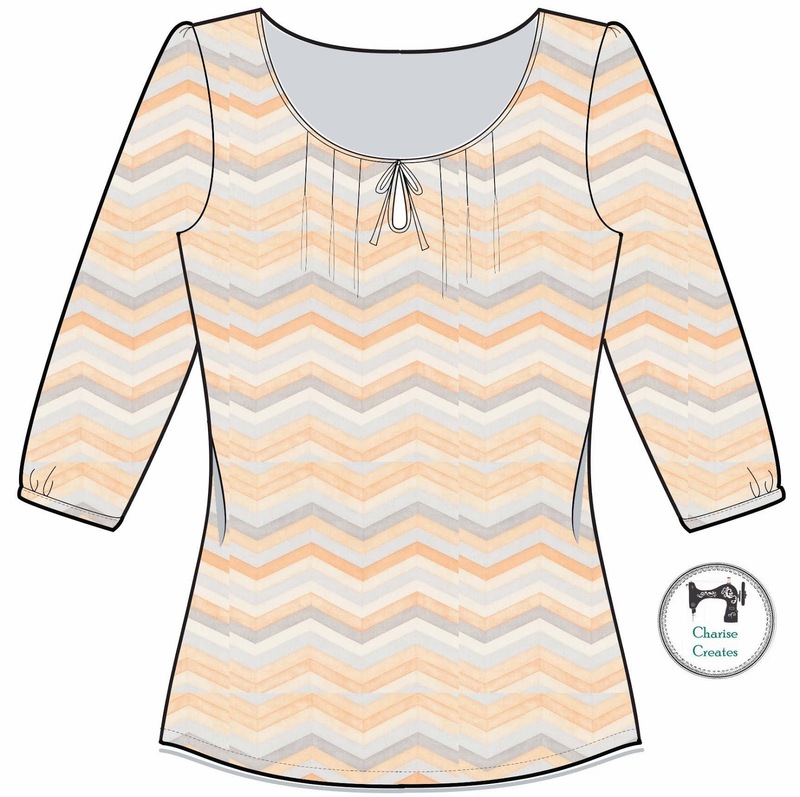 The "Anna" is a sweet and easy to wear style with front neck pleats and a tie neck detail. 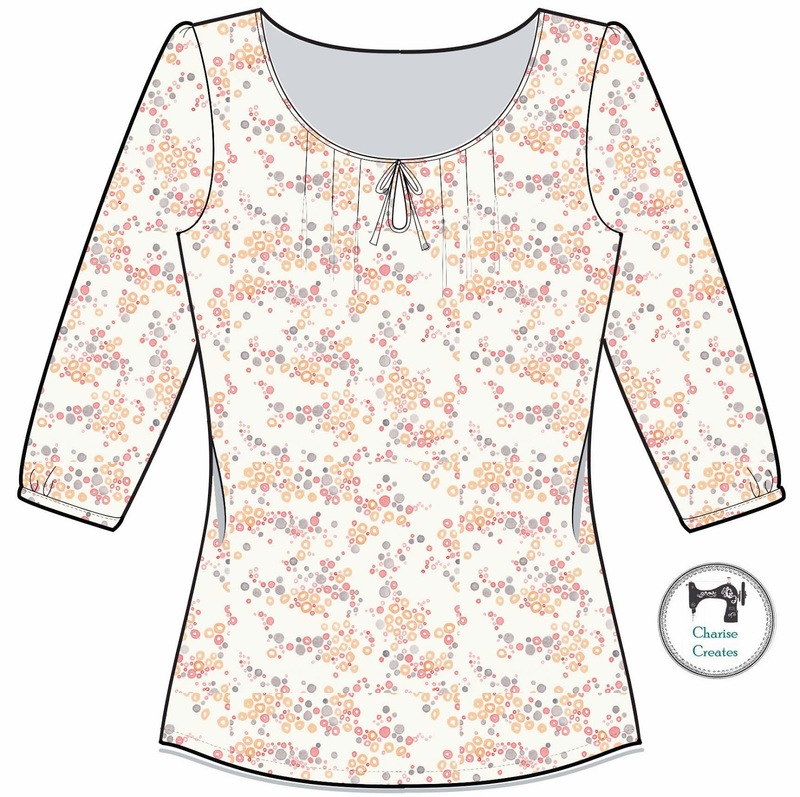 It has a gathered sleeve cap and 3/4 length sleeves. 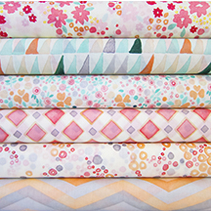 Beth and Kristin from Sew Mama Sew asked each sewist to choose their three favorite fabrics from the line, which was definitely a challenge. My preference was for the florals though all the prints are beautiful! The design process started with a sketch. Then I couldn't resist filling the sketch with the beautiful prints! 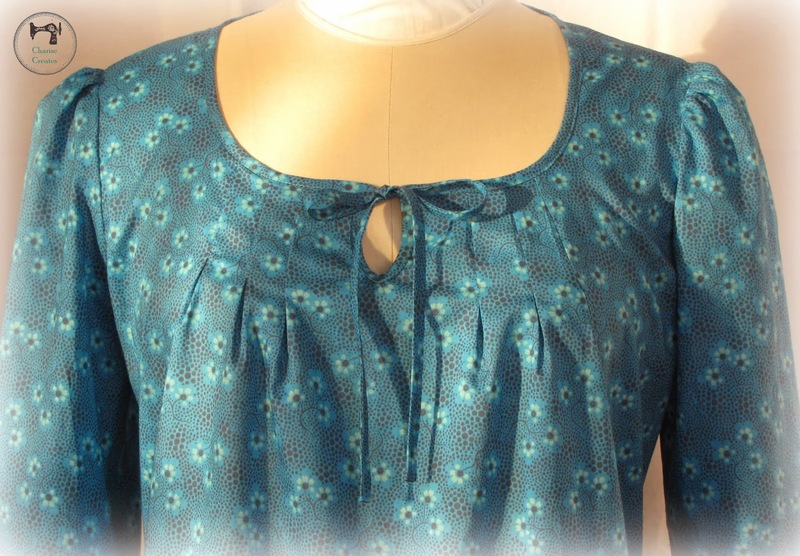 This is the print I used for the blouse - "Abalone Cove"
I love this print too! "Lunada Bay"
The Miraleste Print is a lovely aqua floral! I actually think this one of my favorites - Wayfarers - and it wasn't on my top three list! 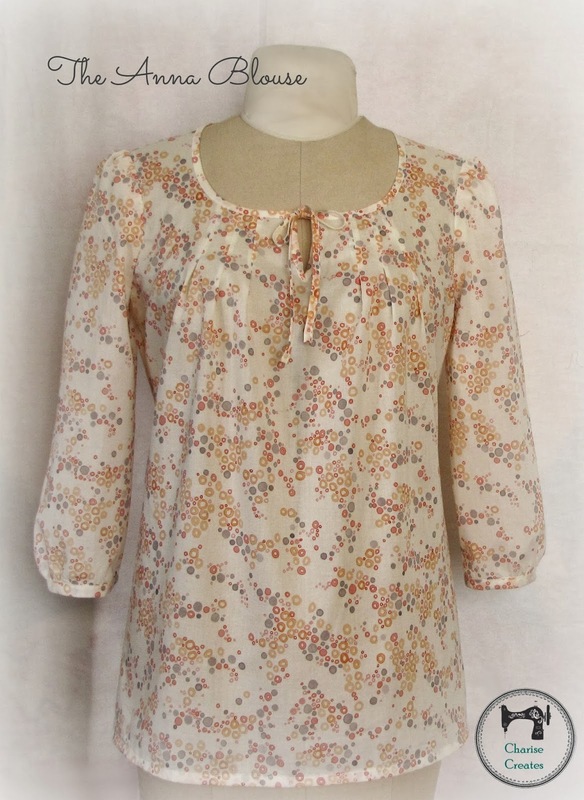 The print gives the blouse a boho 1970's vibe! I stitched up two muslins! The first in actual muslin fabric so I could get the fit just right. The second muslin was made in an Amy Butler voile to test the fit in actual fabric. 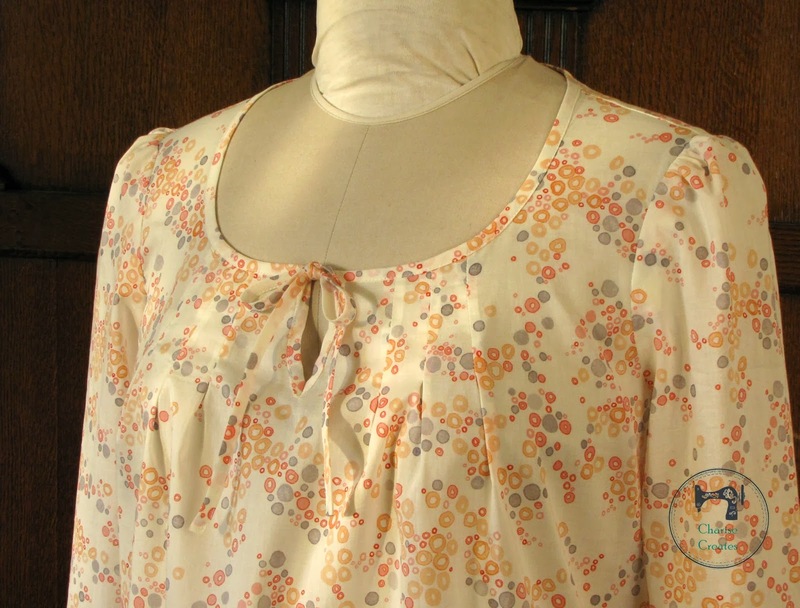 It is kind of nice to already have two spring blouses sewn before the season begins! Please be sure to check out the links to the other sewists in the Cloud 9 Challenge! Gorgeous! Love the different colour interpretations and great to see a company produce prints that lend themselves so well to dressmaking. I love this style shirt and would wear it all the time. Are you thinking of offering a pattern? 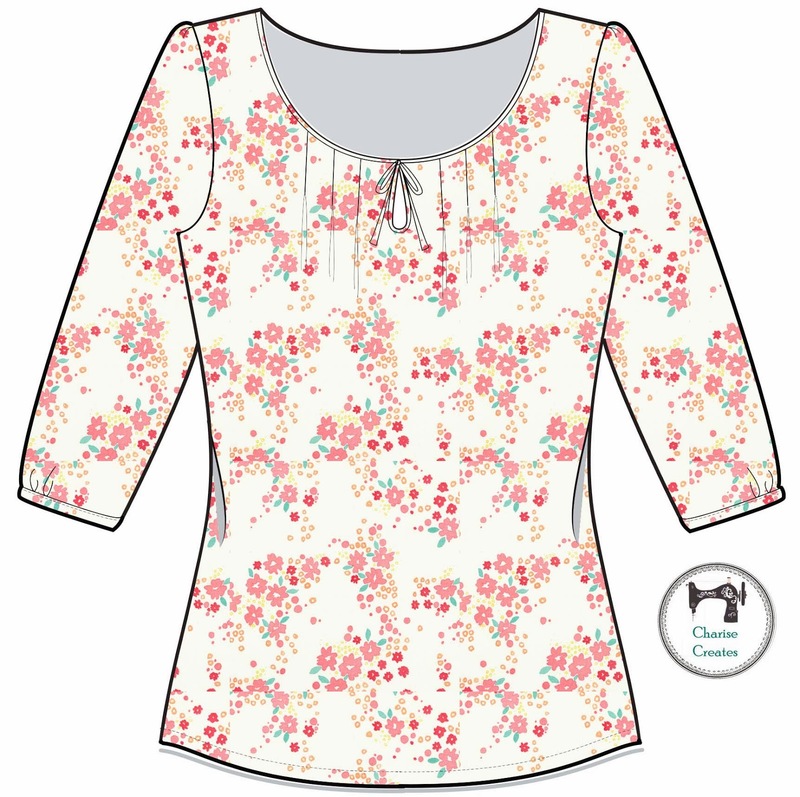 I actually have two jersey knit shirts in this style that I am getting a lot of use out of so a voile one would be nice for dresser occasions. it's so beautiful, charise! i'd love a pattern (or tutorial) if you were even inclined! Ditto on a pattern request! I love sewing my own tops, it's the only way to get a good fit. Loved seeing this!!! Very exciting for me! Thank you! You’re so cool! I dont suppose Ive learn anything like this before. So good to search out somebody with some authentic ideas on this subject. realy thank you for beginning this up. this web site is one thing thats wanted on the net, somebody with slightly originality. helpful job for bringing something new to the web! I think it is so cool how you did the digital drawings of your plan. I want to learn how to do that! And your blouse is beautiful! 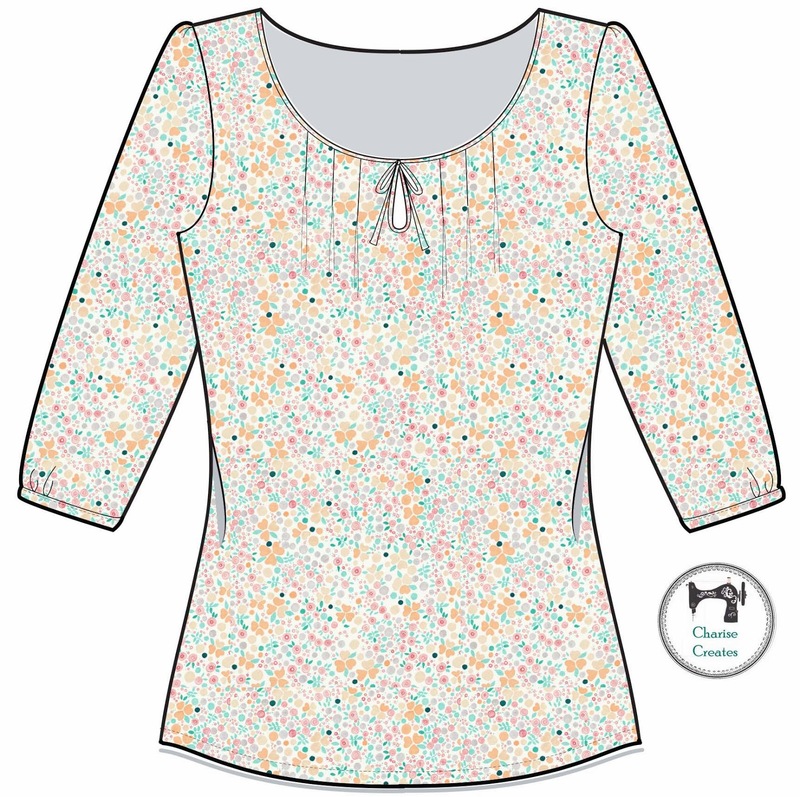 Wow, it's a lovely blouse, and self-drafted! Really like the preview drawings of the different prints on your design, inspiring! Lovely designs with the tops. The fabric looks light and comfortable too. I am so impressed with those who can create their own clothing patterns!! Just lovely!! I wish I had your talent for making these gorgeous blouses. You should feel like a million bucks wearing those! Just gorgeous! Yes, yes, I would love this pattern as well. If not offering it for sale could you suggest a similar pattern. Thanks everyone for your lovely comments. The Pattern is in the works. I will let you know when it is available!!! Approximately how many yards of Abalone Cove should I order for my stash while I anxiously await the pattern? Absolutely love this blouse!! I too would love this pattern! 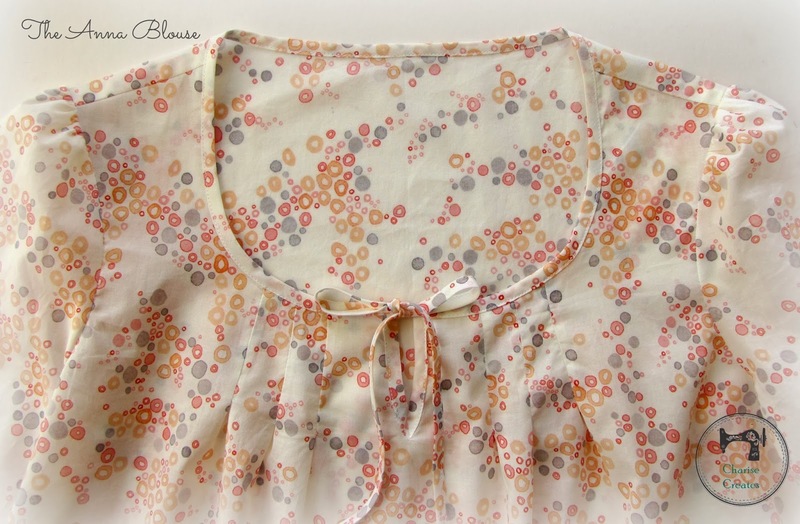 Adorable blouse!